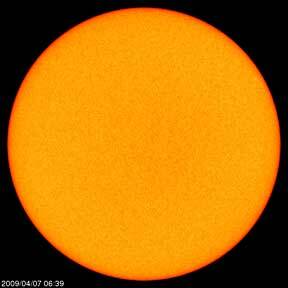 Spotless sun on April 7, 2009. Out of 365 days in 2008, 266 were without sunspots. So far in 2009, January had 25 sunspot free days; February had 23 sun spot free days; and March had 28 sun spot free days. Image source: SOHO. April 7, 2009 Huntsville, Alabama and Boulder, Colorado - A sunspot is a region of intense magnetic activity on the Sun's surface that are cooler than the rest of the sun. That's why they appear as dark spots. Sunspots are at temperatures of roughly 4,000 to 4,500 Kelvin, which is 6,740 to 7,640 degrees Fahrenheit, and are surrounded by hotter solar material around 5,800 Kelvin, or 9,980 degrees Fahrenheit.